Canada Place is a building situated on the Burrard Inlet waterfront of Vancouver, British Columbia. It is the home of the Vancouver Convention Centre, the Pan Pacific Hotel, Vancouver’s World Trade Centre, and the world’s first permanent IMAX 3D theatre (which ceased operation on October 1st 2009). The building’s exterior is covered by fabric roofs resembling sails.It is also the main cruise ship terminal for the region, where most of Vancouver’s famous cruises to Alaska originate. The building was designed by architect Eberhard Zeidler. 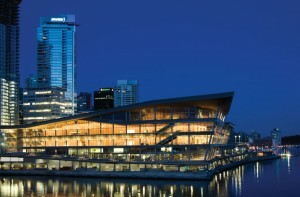 The Vancouver Convention Centre is a convention centre in Vancouver, British Columbia, Canada; it is one of Canada’s largest convention centres. Owned by the British Columbia Pavilion Corporation, a crown corporation owned by the government of British Columbia.